In 1918, Ukrainized postal stationeries - like the one above (it's Bulat #1) - were often cancelled by favour. How do you know if that is the case for any individual card? Normally, you just have to turn over the card and nothing is written on the back. Very simple. In the case of this card, it is not necessary to turn over and look at the back. Why? Take your time. Click on the Image to magnify. The Answer is below. The card is cancelled ZVENIGORODKA 30 10 18. 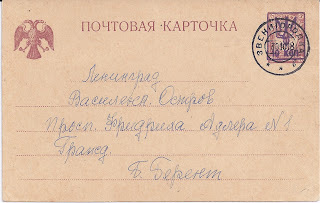 The top line of the address reads "Leningrad". Petrograd was not re-named until 1924, after Lenin's death. So the address was only added much later to a philatelically cancelled card. Whether it is a real address on Vasilevsky Ostrov [Island], I don't know - I can't get a result from Google.